The Optimist - Is This a Big 'Tomorrowland' ARG Connected to D23? The worlds of yesterday, tomorrow, and fantasy were only the beginning… What mystery lies ahead? Only time will tell. Our colleague Silas at ComingSoon was tipped about an interesting viral Disney website that's part of a bigger ARG (Alternate Reality Game) called The Optimist - found at Disney.com. The story-based ARG follows a few fictional characters including "Amelia", a young filmmaker (follow her on Twitter) and a guy known as "Disney Cartography" (also on Twitter) who makes art "inspired by the past, future and what could have been at Disneyland." Will this eventually connect to Tomorrowland, Brad Bird's movie? 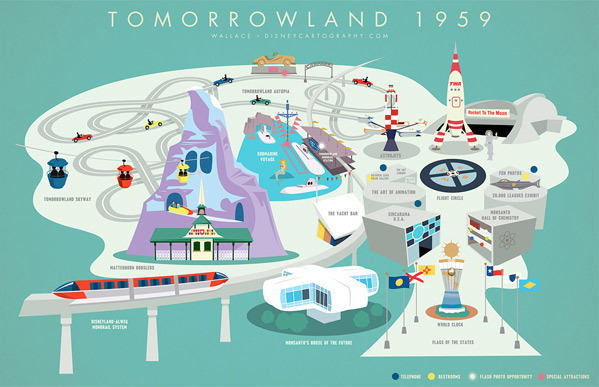 While plot details still haven't been confirmed by Disney, we pretty much know that Tomorrowland the movie is set in the 1950's (it was originally called 1952). George Clooney and Hugh Laurie star, Brad Bird is directing a script worked on by Damon Lindelof, and shooting starts later this summer. The introduction on the website for The Optimist states: "Walter Elias Disney was an optimist who believed in creating a living blueprint for the future. He and his Imagineers - those creative and skilled professional wizards who combine imagination and engineering - made fantasy into reality and built the magic of the Disney Theme Parks. But, what if that was just the beginning?" That's one big hint. But here comes another. It ends: "Amelia, a young filmmaker, has stumbled upon a revolutionary secret…and she needs your help. Collaborate with other curious individuals around the globe to solve a mystery that traverses the web, Disneyland Park, and beyond before culminating at the D23 Expo. Join Amelia and explore Walt Disney’s secrets of Tomorrow…" Land? Maybe. I'm sure we'll catch a couple of updates at the D23 Expo in August. In the meantime, if you're interested in following this ARG whether it leads to something from Tomorrowland or not, sign-up at The Optimist. That links to Amelia's blog Story Orbit Films with more updates and photos.